Suppose there is a nice factory in a temperate climate scenario. Railway tracks run to and from it, providing for a constant supply of resources by train. In addition, trains take the goods to a nearby city. Now, let's say train traffic has become pretty heavy so that the increasing number of products have to be shipped by additional lorries. Building a seperate lorry station is disadvantageous because your trains and lorries would end up in a competition for the goods. You'd be better off if you had just one giant station. However, this would involve building the lorry station right next to the train station. Afraid of removing your complex track layout permanently just to make room for a simple lorry station? Also, access roads have to be built. This is where 'moving' the lorry station comes in handy. For this, you temporarily demolish the railway tracks and interrupt train traffic. Later, when the lorry station is at the desired location, the track layout is restored. Now let's look at this in detail. 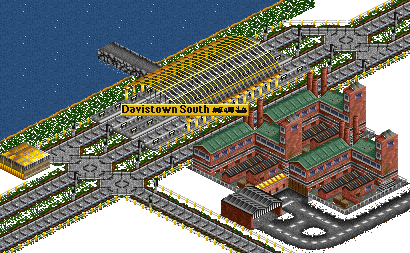 Picture 1 shows the factory, a dock, the train station and the railway tracks. Given the supply routes, we can't remove the canal. And we don't want to remove the bypass railway track between the station and the factory. So we're going to build a lorry station at the southwest corner of the factory building. We first remove a single track tile from the bypass track and build a bus station and a lorry station right next to the train station (picture 2). Thus, we still have just one station as can be seen from the four icons on the sign. Next, we remove the bus station from the current spot and re-build it on the other side of the lorry station, see picture 3. By repeating this process we finally move the lorry station to the desired location southwest of the factory building and establish a road connection to the nearby city, see picture 4. 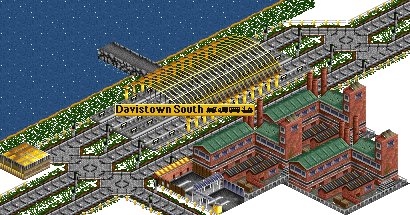 Remember, in order to preserve the single station, we always place the stations on adjacent tiles. In the example just given, moving the station was used to circumvent difficulties with the railway track layout. However, you can even make some extra money with this trick. Consider a single track connecting two train stations at, say, a coal mine and a power station. You'd first build the stations in the vicinity of these so that they collect coal and allow delivering it. Then you'd move the stations closer together in the way described above: Lorry stations remain at the coal mine/power station and bus stations are used to move the train stations. So the actual distance trains travel is reduced, but you get payed for the larger distance given by the station signs that remain at the initial locations of the stations (where the lorry stations still are). This way, you get 'superfast trains'. 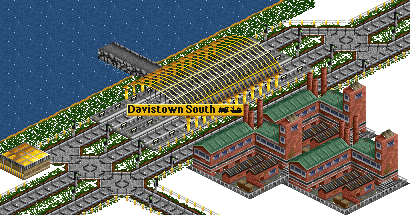 There's one drawback though: You can't move the station indefinitely. After a few tiles, you receive a 'station too spread out' message. In the classic version of Transport Tycoon the distance allowed is much larger.